In last week’s Post, a caption on a photo for the Christmas tree lighting article was incorrect. 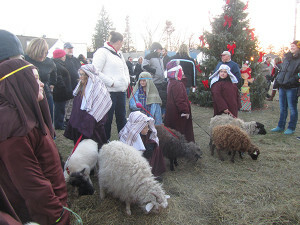 A photo of shepherds with their sheep noted that Calvary Assembly of God had a live nativity—which they did, but the shepherds and sheep in the photo were part of 4H Animal Junction. We appreciate them being a part of the event, along with Double K Farms, and hope they continue to be a part of it for many years to come!